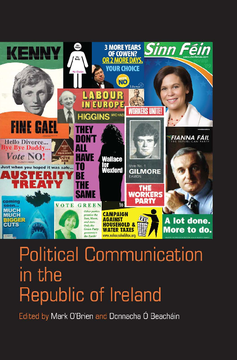 This book presents an overview of political communication in the Republic of Ireland from a multiplicity of perspectives and sources. It brings together academics and practitioners to examine the development and current shape of political communication in modern Ireland. It also examines what the future holds for political communication in an increasingly gatekeeper-free media landscape. The field of political communication, where journalists, public relations professionals and politicians intersect and interact, has always been a highly contested one fuelled by suspicion, mutual dependence and fraught relationships. While politicians need the media they remain highly suspicious of journalists. While journalists remain wary of politicians, they need access to them for information. For most of the time, what emerges is a relatively stable relationship of mutual dependence with the boundaries policed by public relation professions. However, every so often, in times of political crisis or upheaval, this relationship gives way to a near free-for-all. Politicians, spokespersons and sometimes even journalists, become fair game in the battle for public accountability and support. The determination of public relations professions to avoid this and keep the relationship based on mutual dependence has become a central component of modern statecraft and systems of governance. The need to keep politicians and the media ‘on message’ and use the media to inform, shape and manage public discourse has become central to the workings of government, opposition and interest groups. On the other hand, the packaging of politics has potentially troublesome implications for the democratic process. In the era of the instant news cycle, new technologies and constant opinion polling, just where does information end and misinformation begin? With millions being spent annually on advisors and ‘spin-doctors’, just where does media access end and media manipulation begin? Dr Mark O’Brien is Lecturer in the School of Communications at Dublin City University. Dr Donnacha Ó Beacháin is Director of Research in the School of Law and Government at Dublin City University.